Lip augmentation is a cosmetic procedure commonly adopted in order to have plump, full and luscious lips. An injectable dermal filler is a highly preferred way of lip augmentation. There are several types of fillers that are injected in lips and around the mouth to make the lips look full and nice. Earlier collagen was the only option but today variety of dermal fillers based on hyaluronic acid have emerged, which are much safer and have long-lasting effects. Hyaluronic acid is a natural substance found in the body and is highly attracted to water and binds to moisture. This natural substance helps increase volume of lips with a lower chance of any allergic reaction because dermal fillers are based on hyaluronic acid, a substance found in the human body. Dermal fillers have taken over collagen and fat injections, which were common in earlier days, as the latest options are safer and have less side-effects. Hyaluronic acid has a lower propensity to cause lumps and bumps but if they occur, they usually even out as the swelling comes down. 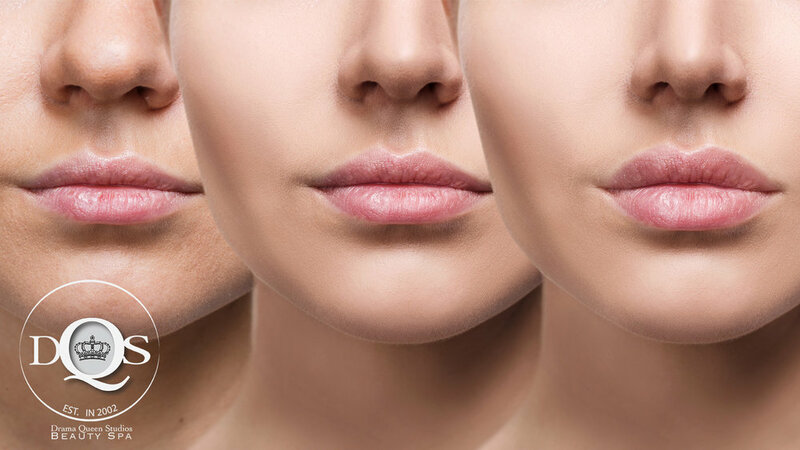 Dermal fillers improve the appearance of the lips by enhancing shape, structure and volume. The effects of dermal fillers typically last around six months after which more injections are required to keep the volume of the lips. On injecting the dermal filler, the gel in the filler supports and shapes the tissues of the lips. The doctor doing the treatment decides the amount of fillers to be injected in the lips, depending upon the required volume of the lip. The injections are gradually given in different appointments until the desired result is achieved. Thin Lips - Thin lips are augmented by injecting the filler to increase the size of both upper and lower lip with a gentle curve line. Upper Thin Lip - If the upper lip is thin compared to lower lip then filler is injected only in the upper lip to build up the curve to balance it with the lower lip. Lower Thin Lip - In case if lower lip is thinner then filler is injected in the lower lip to extend curve in order to make the lip look bigger. Sharp Cupid's Bow or Narrow Corner - The filler is injected in the widen sides of upper and lower lips to fill in the Cupid's Bow. Full Center and Tight Corners - Sides of upper and lower lip are injected with fillers to build out the sides and avoid much curve toward corners. Dr. Navi Rattan graduated from the University of British Columbia with a Bachelor of Science and Medical Doctorate. He completed his Residency training in Family Medicine and has received Neuromodulator and Dermal filler training from the Medical Art Academy. He is a member of the College of Physicians and Surgeons of British Columbia, College of Family Physician’s of Canada and Doctors of British Columbia. Dr. Rattan is able to provide minimally invasive cosmetic treatments to enhance patient satisfaction with their appearance in a natural way. He is excited about aesthetic medicine and looks forward to working with you. Posted on May 23, 2018 by Bal Purewal.